Spring has come to the Arctic, as the extent of the sea ice appears to have stopped growing this year and has begun its annual decline. Arctic sea ice extent for March 13. The orange line shows the average extent for that day from 1981 to 2010. Click twice to enlarge. 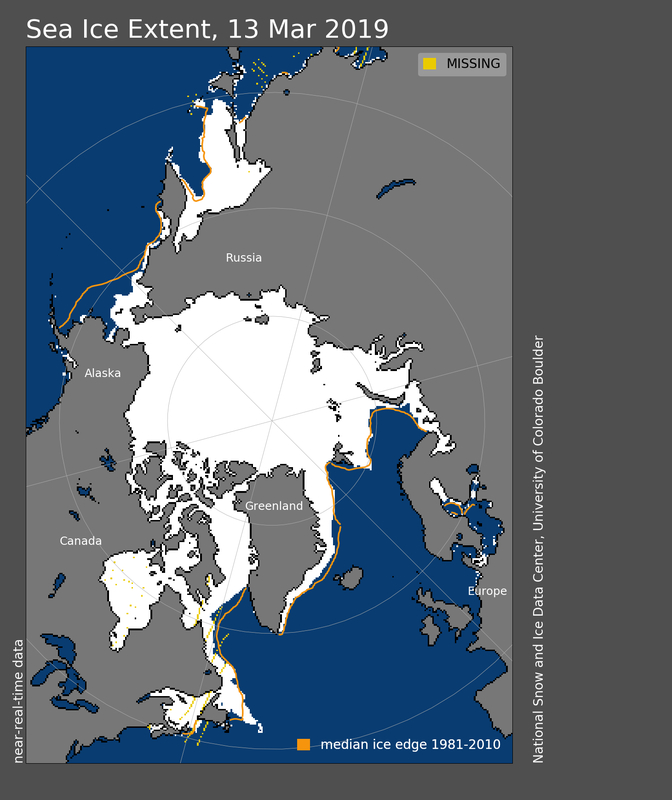 The maximum extent of sea ice was probably reached on March 13, when it reached 5.71 million square miles, according to the National Snow and Ice Data Center. That would tie it with the year 2007 for the seventh lowest extent in the 40-year record of satellite data. It is also the highest extent of ice since 2014, as one can see in the chart on the NSIDC News and Analysis page. NSIDC, supported by government agencies, says the analysis is preliminary, since it is possible that more ice could accumulate with shifts in the weather. Oil-drilling projects in Wyoming have been blocked by a federal judge, who says the Bureau of Land Management needs to first consider the cumulative effects of climate change from those projects. 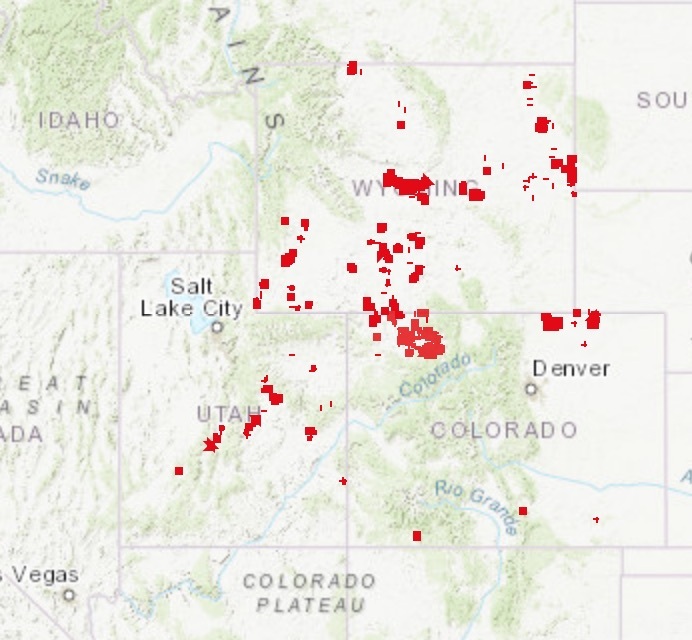 Map of recent oil and gas leases in three Western states. Click on map for zoom-in video. The lawsuit, brought by WildEarth Guardians and Physicians for Social Responsibility, alleges that 473 oil and gas leases covering 460,000 acres in Wyoming, Utah and Colorado were in violation of the National Environmental Policy Act for failing to discuss the full impacts on climate change. The judge agreed, applying his specific ruling to 282 leases. Reporter Nichola Groom covered the story for Reuters. Monday’s meeting of the Southern Resident Killer Whale Task Force included an afternoon session with presentations on the effects of climate change, with a special focus on the effects of salmon and orcas. It also includes a talk by Bill Dewey of Taylor Shellfish, who describes how shellfish growers are working to overcome the damaging effects of ocean acidification on their industry. The presentations on climate change were followed by discussions by task force members about how they should address the issue of climate change. The climate change discussion can be heard in the video below. For those interested, I blogged about the morning sessions yesterday in Water Ways, which involved legislative progress, also recorded by TVW. Item 4: Economics to end fossil fuels, but when? Author Bill McKibbon in The New York Review of Books uses two economic reports about fossil fuels and geopolitics as a springboard for writing an engaging piece that describes the dynamic competition between fossil fuels and clean energy. “(Author Kingsmill) Bond writes that in the 2020s — probably the early 2020s — the demand for fossil fuels will stop growing,” says McKibbon. “The turning point in such transitions ‘is typically the moment when the impact is felt in financial markets’ — when stock prices tumble and never recover … Precisely how long it will take is impossible to predict, but the outcome seems clear…. “A far more important question, of course, is whether the changes now underway will happen fast enough to alter our grim climatic future,” he continues. “Here, the answers are less positive. While the federal government moves ahead with plans for extensive oil and gas leasing, a new analysis by Sightline Institute raises questions about whether the process of fracking is really paying off. “By some measures,” the authors wrote, “America’s fracking industry had a banner year in 2018. Shale companies produced more oil and gas than ever, lifting total U.S. output to all-time highs … (But) a cross section of 29 publicly traded, fracking-focused oil and gas companies spent $6.7 billion more on drilling than they realized from selling oil and gas…. Authors of the report are Sightline’s Clark Williams-Derry, Kathy Hipple and Tom Sanzillo. A new report funded by a coalition of environmental groups has found that 33 global banks have provided $1.9 trillion to companies expanding their development of oil, natural gas and coal since adoption of the 2015 Paris climate accord. Such financing has risen in each of the past two years, the report says. The report, “Banking on Climate Change 2019” says the four largest bankers of fossil fuels are all U.S. banks — JPMorgan Chase, Wells Fargo, Citi and Bank of America.